Federation University Australia > About us > Our university > Our history > Geoffrey Blainey Research Centre > Honour Roll > TRENGROVE, Thomas H.
Thomas Trengrove was a student of Grenville College before attending the Ballarat East Art School. In 1900, at the age of 21, he was appointed a junior art teacher at the Ballarat School of Mines (SMB). He was an art assistant when Trengrove left for Stawell in 1908 where he was the Technical School art master for 14 years. Interestingly John E. Grant from Daylesford Technical School is accredited with completing twelve of the carved panels. 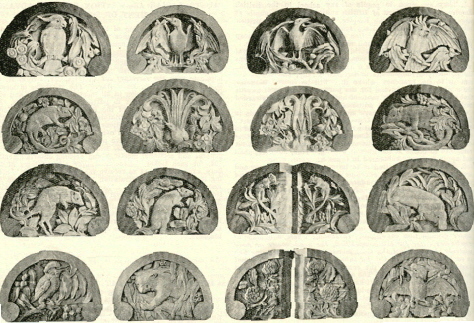 It is believed that Grant carved the first twelve images depicted, with Trengrove being responsible for the last four. The building of the Villers-Bretonneux Memorial School was made possible by the donation of 12,500 pounds from the Education Department's War Relief Fund. It came about after the 1921 decision that citizens of Melbourne adopt the town of Villers-Bretonneux and provide money to rebuild the ruined houses after World War one, one of which was the schoolhouse. The Assembly Hall interior was panelled in Victorian blackwood, the design including 16 pilasters, each of which was surmounted with a carved cap representing Australian flora and fauna. The timber is beech with a frame of blackwood. The school was seen as a permanent memorial to the valour and devotion of the Australians who fell in defence of Villers-Bretonneux in 1918. This biography researched by Clare Gervasoni, November 2006.